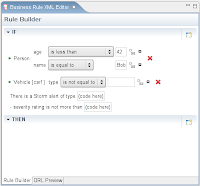 JBoss Rules v3.0.6 was released. 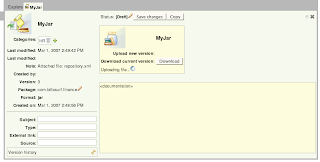 As always, you can download it from the project site http://labs.jboss.com/portal/jbossrules/downloads. This is a maintenance release, with a few bug fixes. We strongly advise all people using JBoss Rules versions 3.0.x to upgrade to version 3.0.6, specially those using dynamic rules. Our special thanks to Frederic Burlet and Einat Idan for providing patches and all the community users for using, testing and reporting bugs and suggestions. Follows the list of fixed bugs. After talking more abstractly about writing (hopefully better) rules, I would like to go down a bit and talk about real rules engines use cases and some ideas on how to write rules in such cases. I sent an e-mail to the users list asking for cases that users would like to discuss in more detail and some suggestions started to arrive. In this post I will talk about a subject that was suggested by Neil Goldman that was also kind enough to share his thoughts about how to model rules for Monitoring and Time-Sensitive Applications. It is not the scope of this post to talk about Event Stream Processing, that besides being related to the subject, have different requirements and are too extensive to be included in this single post. I will use JBoss Rules (a.k.a. Drools) for the examples, but the ideas should possibly be used with any other engine. Monitoring Applications are applications that monitor and eventually take actions based on inputs from sensors (temperature, weather, movement, etc) or agents (network elements, managed systems, managed beans, etc). They usually have requirements of working as Near-Real-Time Applications and are designed to react to system state changes. Question is: how do I architect my application leveraging the advantages of the rules engines to monitoring applications? Lets discuss the case using a simple practical example: let's say you have a monitoring application for your Air Conditioning System (ACS) that must control it to keep the temperature under a certain range. Having your constraints also modeled as facts (the TemperatureRange fact in the above example) also helps writing more robust rules, avoids the need for hardcoded values, and allows a single rule to react to several different conditions. Monitoring applications may also work with stateless working memories, but a statefull working memory usually makes more sense for cases like described above. Time-Sensitive Applications are applications that reason over or react to time. For example: billing applications, applications that run simulations, task schedulers, etc. Rules in such applications will be directly or indirectly dependent on time. Here, it is important to not confuse the use of time as "data" to your rule and the use of time as "metadata" to your rule. 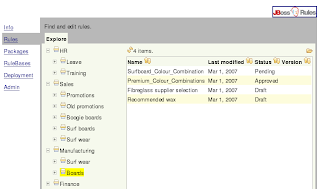 Rules engines usually offer features to handle time as a metadata, like allowing one to specify a rule effective and expiration time, among other things. of such criteria to these changes. b) the rule engine can be told about. " Yes, you want a controlled clock to reason over. A good analogy is to think about the clock as a sensor from the previous examples. In the previous examples, the application controls when and how the sensor is updated as a way to keep the system state consistent. The same way the application can control when and how the rules pseudo-clock gets updated. system consistency: you can guarantee that no external, unpredicted or predicted event will cause inconsistencies in your facts (all sysadmins know the headaches of going back one hour in time when daylight savings period is over) and having controls inside your application to handle such situations is great. test automation: if your rules are reasoning over a pseudo-clock, you can easily write test that advance the clock as needed to test specific scenarios, while in production, your pseudo clock may be synched with the real clock in predefined intervals. It is important to note that, as mentioned above, there is no restriction to periodically synchronize your pseudo-clock with the system clock, as long as you have the control over when and how this update is done. rule "Fire based on time"
rule "Fire based on task"
You probably noticed that the comparison between the scheduled time and the current time in the first rule above is made with a "<=" operator. This is needed because usually, there is no guarantee that your rule will be executed precisely at the given time (except when running in a real time platform), but "as soon as possible" after that time. So, it is a good practice to always constrain time using ranges or thresholds instead of absolute values. Thank you to Neil for raising the topic. The above is just the tip of the iceberg, but I hope it is a start for deeper research for those interested. How do I iterate over a collection? How do I execute an action in the LHS? All the above questions may expose some level of misunderstanding of declarative programming and/or lack of knowledge in forward chaining engines. DISCLAIMER: This is not negative criticism. This is only an acknowledgement that we, "rules people", need to do more on the evangelization side. We need to make it easier for people to understand and learn the principles of declarative programming. Having said that, we all know that writing rules is a creative job and there is no single way of doing it, in the same manner there is no single way of interpreting a song (unless it is a Mozart's composition). There is no right or wrong, but there are better and worst ways (even being a bit subjective). So, I will try to give some tips on how to identify the symptoms that may indicate that something is not going well with your rules, and how to improve the rules making those symptoms disappear. If your rules are requiring several functions to be created or your consequences are getting complex, it may be a sign that something is wrong. Rules are supposed to be a declarative description of a pattern you are looking for in your facts and the consequence is supposed to be a sequential list of actions to execute when that pattern is found. If your rules contains flow control structures in the consequence, like "if" or "switch", there is a high probability your rules are doing something in a really bad way. Loop structures like "for" and "while" may be required in some very rare cases, but they are often enough a sign of problems in the rules too. Mark my words: "EVAL IS EVIL". Eval is a very flexible CE, but it is also a BIG problem too. To start with, your rules frequently become unreadable if you use it extensively. Also, since you can do almost anything inside an eval, the engine can not make any assumptions about it and so it is really difficult to provide any optimization. In JBoss Rules 3.0.x, there are some situations that require the use of eval(), but we worked a lot on improving expressiveness of the language and, in JBoss Rules 3.1.0-M1 and later, we reduced a lot the situations that require eval(). So, if you are using a lot of evals, you probably can do better. Probably the most important single item you need to worry about is how expressive is your Business Domain Model. A simple analogy is to compare it with a data model and an RDMS system: we all know that the performance, simplicity and efficiency of SQL queries are directly related to the quality of the data model. The same way, the performance, simplicity and efficiency of the rules is directly related to the quality of the business model. Different Rule Engines have different ways of representing your Business Model, but fundamentally, your Business Model will be an instantiation of the ontology of your business. In other words, you know what your business is, what the requirements to running it are and what you need from your information systems. So, formally describe that ontology using your rules engine "language". JBoss Rules/Drools works natively with Java Object Oriented Models, but it also allows you to define higher level models using Decision Tables, Domain Specific Languages, or any other language you provide a driver for (see Mark's post about supporting CLIPS, for instance). prefer flat models over deeply nested ones. It is always easier to write rules for flat models. 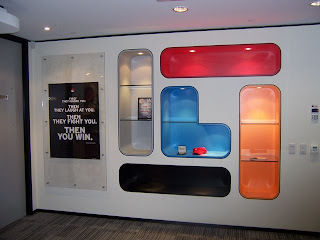 ask yourself the questions your rules will ask and see if you can answer them through the use of your Business Model. If it is confuse, refactor your model and try again. 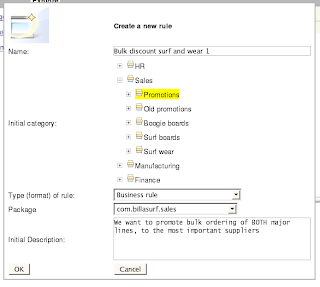 Simple example: your rules will apply over orders, products, and the products in the orders (let's call them items). So, does your model allow you to know about orders? 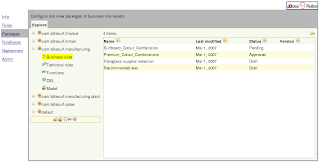 Does your model allow you to easily know about the items that compound your order? Does your model allow you to easily know the details of the products in each of the items of your order? As you can see, this is a very similar exercise we go through when designing data models. write your business rules in your natural language (English, Portuguese or whatever). Identify all objects referenced in your rules. For each object identify all referenced attributes. For each attribute, identify all constraints applied over that attribute. Now check if your business domain model contains those objects (facts) with those attributes and if it is possible to apply the constraints over those attribute types. It may appear like we are doing Object Oriented analysis here, but it is not really the same; we are talking in a higher conceptual level, since, whatever the tool you use, it will need the same information, being it OO based, template based, or even a higher level DSL. Rule engines usually know how to handle a fairly heavy load of facts, so let the engine do its magic. If you want to reason over a nested set of objects, assert all of them (not only the top level ones) into the engine and make sure your business model models the relationship between them. After that, writing your rules will be easier and the engine will be able to optimize execution (when compared to using eval and other constructs to access deeply nested structures). Example: if you have an Order fact that contains a list of OrderItems, assert both Order and OrdemItems as facts (if you need to reason over OrderItems too, obviously). All the above tips have exceptions, but for the general case, following the above tips will help you write better rules. There are good books reference in the documentation page and I recommend those interested in learning more to read them. Writing good rules is usually very simple for those "initiated", but may not be so simple for those "initiating"... :) I guess it is like using a spreadsheet: once you know your way, it is an incredible powerful and flexible tool, but you may need a hand to start using it. I will try to follow up this post with concrete examples of writing rules. Maybe it will be helpful for some of you. A new feature has been added to the JBoss Rules code, allowing users to create a graphical flow chart that defines the order in which rule sets should be evaluated. This blog shows some examples on how to use ruleflow. Ruleflow will be available in the next milestone release, and really anxious users can already try it by building the latest version on svn. Figure 1: A ruleflow showing a simple sequence of two ruleflow-groups that makes sure that all rules responsible for validating orders are checked first before trying to process these orders. Figure 2: A more advanced ruleflow showing parallelism, conditional evaluation of rule sets (e.g. the rule set responsible for processing orders should only be executed if no errors were found when checking the order) and looping. * A new editor for creating ruleflow files (*.rf), as shown in the next screenshot. Whenever you try to save such a ruleflow file, a corresponding model file (*.rfm) is created that contains the definition of the ruleflow. The ruleflow file (*.rf) contains the graphical information. * A wizard for creating a new ruleflow file. More details on how to use ruleflow will be added in the near future. We are however already interested in getting some feedback about the usefulness and useability of ruleflows, and possibly some extension you might find interesting. SBVR is a OMG standard for natural language rules and vocabularies (nominally using English). We think SBVR (Semantics of Business Vocabulary and Business Rules) is an important and useful standard, which can be used for rules interchange in a "source" and human readable format (which RuleML? and RIF are not aiming to do). The rules themselves - which are written according to the SBVR vocab. SBVR comes under Model Driven Architecture (MDA), and is defined a "Computation Independent Model" (CIM) - what that means to you, is that SVBR is designed primarily for human consumption. However, it is defined in terms of formal logic, and detailed enough to generate models and rules for a specific platform. The next layer "lower down" to CIM in MDA is PIM (Platform Independent Model) - which is where things like RuleML come in. Lower again in MDA terms is the PSM (Platform Specific Model) - this is where rule engine specific languages kick in. Anyway, enough of my flawed MDA tutorial (if you have followed along this far, well done !). What brought SBVR to my attention is the work of Maurizio De Tommasi and Pierpaolo Cira, and their practical work on a SBVR plug in for eclipse called "sbeaver" - you can read more about sbeaver here. We are working with These guys to have tooling and a SBVR framework to author rules, and manage vocabularies for JBoss Rules (narrowing SBVR down to production rules to start with). Although SBVR is a CIM (see above) - we think its possible as a format for capturing business rules, and actually generating executable rules directly (perhaps with some assumptions built in - for instance SBVR vocabularies are not strong on data type information that I am aware of). The first steps are a proof of concept to generate DRL rules from SBVR. I am also interestsed in the SBVR vocabulary definition "language" as a generic "business object model" for the rule engine to use (regardless of if SBVR is used) - still under investigation. So, what can I do with SBVR? This is where you define concepts about the business model, and things like synonyms, all of which help SBVR understand sentences. You can see content assistance is pretty critical - this is a structure language, but much more free form then templates allow, but still - smart content assistance like is being showed here is invaluable. I look forward to working together on integrating this ! Progress is going well with the Clips parser I now have the full LHS working, exception functions. 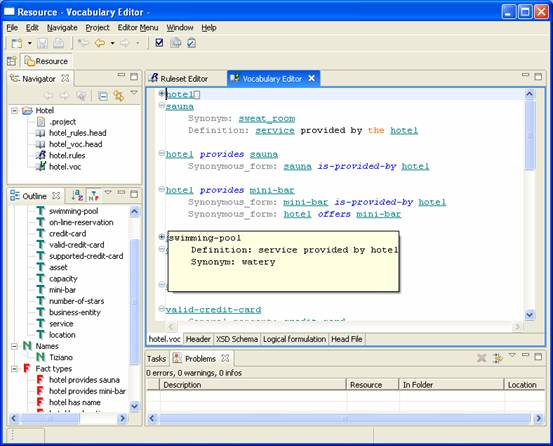 That includes the 'and', 'or', 'not and exists conditional elements, with full nesting, including 'and' and 'or' inside the 'not' and 'exists'. Patterns work with literals, bound variables, predicates and return values. I'm now working on functions at which point we should be able to execute Clips rules inside the JBoss Rules engine. Probably the hardest part with functions is finding a sane way to deal with primitives in functions, especially built in Math functions. After that we'll look at mapping our 'accumulate', 'collect', 'forall' and 'from' implementations. We have often stated that the Drools rule engine is fully language independant, but to date it's only had two parsers - XML and DRL. For a bit of fun this weekend, hey I'm a willd type of guy, I went ahead and started on an experimental Clips grammar with ANTLR, although its still a long way from being finished. I hope It should eventually provide a migration path for Clips users as well as demonstrate how people can build their own grammars for the Drools rule engine using ANTLR, you don't have to use ANTLR, but its our parser of choice. Clients who use other vendor products and want to migrate, but worried about the investment in the authored rules, can now write parsers for those products targetting JBoss Rules; obviously there are other things to consider like feature parity and execution models. We also support "dumpers", via the visitor design patter, making round tripping possible - i.e. currently you can load an xml and dump drl, and vice versa, we will try and make the same possible with Clips. Clips/Lisp is a fairly simple grammar so this is a great learning project for anyone that wants to learn ANTLR and how to write custom parsers for the Drools Rule Engine; so if you want to help out why not pop onto codehause IRC #drools, or subscribe to our developer mailing list, and we'll help you get started. And for those interested here is the current unit test. This demonstrates the intermediate AST we use to build a language agnostic view of a grammar. This AST is "dumb" and we call it Descr, short for Description, this is because everything at this stage is held in a String format; little or not validation has been done, it's just a pure string based tree representing the rules, this is then pass to the PackageBuider which validates the descr tree and builds the resulting rule AST. Well, its been a while since any updates. In the mean time I have moved house, twice, once to Sydney (temporarily) and then back to my home in Queensland, so its been a disruptive period. 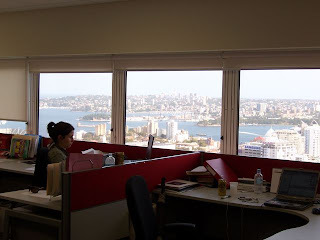 I have been working out of the wonderful Red Hat Sydney office (North Sydney, photos later - amazing view ! ), as well as dropping into the Queensland office (no photos, not so scenic). These 3 aspects correspond to the 3 groups that will be using it, in many cases there is overlap (ie users could be developers, or users could be non technical, or a developer could be all three !). Keep this rough division in mind when reading through the rest of this introduction (not all the functionality applies to all the groups). Of course, the pretty stuff you see is just the icing on the web cake, but there is plenty going on underneath, as has been covered before, so I won't bore you with it. Its important to note that the IDE (as shown previously by mark) forms a part of this (but I won't cover it here). This, coupled with recently described new features makes for a load of goodness. Categories: As mentioned previously, generally you want to start with some categories created to help you find your rules. Categories are completely non technical, in the sense they can be called whatever you want, and do whatever you want, they have no bearing on how the rules work. This would normally be a BRMS Admin type of job. 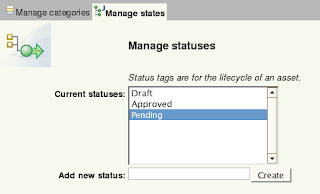 Status Management: You can use status flags (any item can only have one status at a time, whereas it can have multiple categories) to manage, well, statuses (or statii???). This can effect deployment (if you want it to). 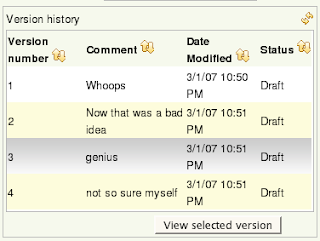 The system starts with just a "Draft" status - any new changes are saved as draft status. You can add more to this list. Statuses are applied either on the individual "asset" level, or at a whole "package" level - if you do it at the package level it applies it to all the assets below it. This would normally be an Admin job. Assets: I have mentioned "assets" - well the short version is that they are really just rules, or a decision table, or a chunk of rules, or a model, or a document - any thing that you want to treat as one controlled, versionable unit (an "atomic" unit if you like). This also includes other config and definition items needed for rules, and in future, things like processes and service definitions. We have a dream. This is a KEY POINT to keep in mind, if your mind is as warped as mine. From here you can browse for rules, or you can view and edit the package configuration (all the top level stuff you need to make a ruleset work). This is a fairly technical view of the world. (if you look carefully you will see the tip of the Sydney Opera House). Browsing a package: Packages show a breakdown of broad asset types, according to their "format" (which is a Dublin Core attribute, for those who care). This little bar of "hieroglyphics" allow you to launch various wizards to create new things (packages, models, rules etc) from within the package view of the world. There are tool-tips to tell you what each one does. 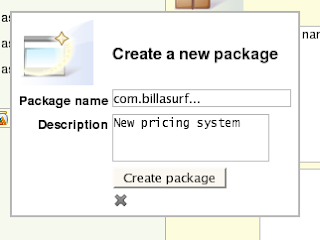 There are also some other wizards which can help you out with configuring the package, should you need help ! 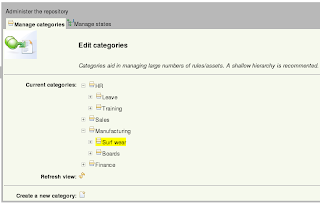 Browsing rules: When you use the rules "tab" - you can use the previously defined categories to navigate lists of rules. Phew, thats a lotta buttons. On the left hand side of the web view is all the boring "meta data" including lists of categories that the rule belongs to. The bottom right is the all important documentation. (even DSL rules are in on the action, complete with content assist, many people still like the personal tough you only get with plain text). (this shows a list of snapshots, from the "deployment" tab) of course this is an Admin feature ! (this shows a frozen view of a package, exactly as you took it, back in the good olde days). OK, that's it, that should be sufficient for now. PS this is of course available in SVN, we always develop out in the open: drools-repository and drools-jbrms are the models for anyone crazy enough.